Greetings, blog readers! The Got Books event has at long last arrived! This means that it's time for a giveaway! You all may have read my review of Stardust which I posted on Monday. This is one of my all time favorite books, so I've decided to give you all the opportunity to win it! As you all can see, there is one other item in this photograph. What is this, you say? Why, it's a bookmark, called the Stardust Snowdrop Bookmark, the significance of which you will understand when you read the book. I bought it, as well as one for myself, from Chloris's Conservatory on Etsy! I highly suggest taking a look at this lovely shop. Now that you know what you can win, here are the rules. 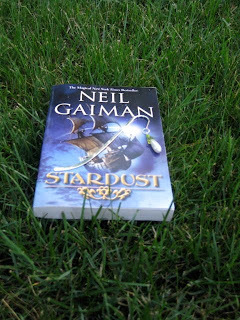 One winner will receive Stardust by Neil Gaiman and the Stardust Snowdrop Bookmark. If you advertise this giveaway on Twitter, Facebook, etc., you will receive one extra entry. The giveaway will end at 11:59 p.m. on July 24th. I will announce the winner of this giveaway, as well as my 100 Followers Giveaway, on July 25th. I've never read this and would love a chance! Great job on the post and definitely a magical prize pack there! Thanks for helping to spread the bookish love...happy reading! Thanks so much for the giveaway! Been wanting to read more Neil Gaiman! Love this giveaway! I've been wanting to read this ever since I saw the movie. Thank you so much for the opportunity and for participating in Got Books?! Neil Gaiman rocks! Thanks for the great giveaway!